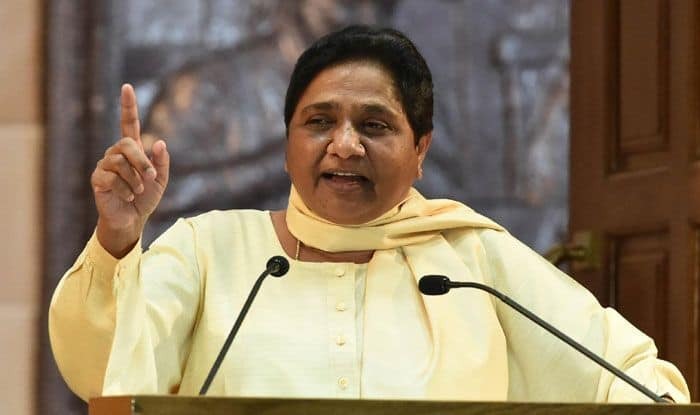 The Election Commission barred Mayawati, Union Minister Maneka Gandhi, Uttar Pradesh Chief Minister Yogi Adityanath and Samajwadi Party (SP) leader Azam Khan from campaigning for 48 and 72 hours respectively. Lucknow: Bahujan Samaj Party (BSP) chief Mayawati has hit back at Election Commission (EC) for the 48-hour ban on her campaigning. Terming the EC’s action as a ‘murder of democracy’, Mayawati alleged that the poll body seems to have taken a hasty decision under ‘pressure’. Accusing the poll body of having a bias towards Prime Minister Narendra Modi and Bharatiya Janata Party (BJP) chief Amit Shah, Mayawati further said that the EC had given a free hand to both the leaders for spreading hatred. She added that it seemed the EC has shut its ears and eyes when it comes to them. BSP chief Mayawati was barred from election campaigning for 48 hours over violation of Model Code of Conduct (MCC). The ban came into effect at 6 AM on April 15. The EC put a hold on her campaigning for her comments while seeking votes from Muslims at a poll rally in Deoband last week. “Don’t get divided, vote en masse for Gathbandhan. We have BSP vote in every seat, SP is also mobilised. If Muslims want BJP to lose, they have to stand firmly behind Gathbandhan,” Mayawati had said. Clarifying her remark, Mayawati stated that her comment wasn’t against any religion and it also did not vitiate the atmosphere. “I had made it clear in my explanation that I hadn’t sought votes on basis of caste/creed. I had only urged Muslims to ensure that their vote isn’t divided. The Election Commission overlooked all this,” she added. With the ban extending for a period of 48 hours, Mayawati would not be able to address a rally in Agra on Tuesday. Elections in eight of the 80 seats in Uttar Pradesh will be held on April 18. The EC on Monday afternoon barred Mayawati, Union Minister Maneka Gandhi, Uttar Pradesh Chief Minister Yogi Adityanath and Samajwadi Party (SP) leader Azam Khan from campaigning for 48 and 72 hours respectively. The order came into effect hours after the poll body was pulled up by the Supreme Court for failing to take action in cases of Model Code violation.